In July 1968 the battle at Khe Sanh in western Quang Tri Province came to a quiet close when the fighting stopped, the guns fell silent, and the large toll of casualties among American, North Vietnamese, and South Vietnamese troops mercifully came to an end. But 45 years later, for 18-year-old Ho Van Y, the battle at Khe Sanh had not ended. An explosion at his family’s coffee plot near the former Ta Con Airstrip in 2012 ripped away Y’s right leg and made him a new casualty of the war. At his Van Kieu minority village in Huong Tan Commune, Y had always been a big help to his parents with the family’s coffee production. Now Y considers himself a burden for them because of his disability. 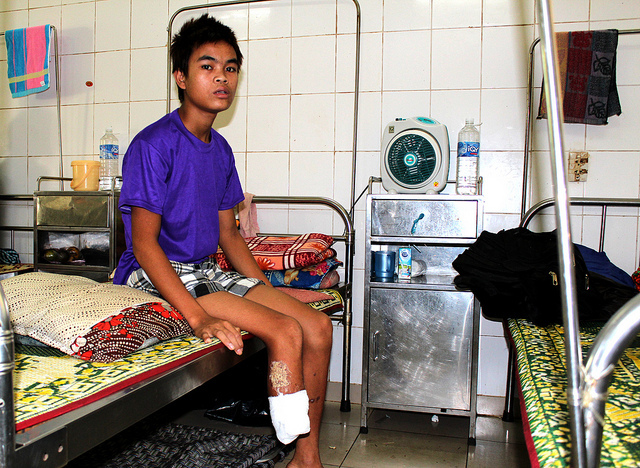 17-year-old Ho Van Y at the Quang Tri General Hospital twenty eight days after the explosion that ripped away his right leg on the 2nd of October 2012. This week Project RENEW’s mobile Prosthetic and Orthotic (P&O) Outreach team, on one of their field visits to Khe Sanh, visited Y’s family and examined his stump. The P&O team determined that Ho Van Y is now a high priority to receive a new state-of-the-art prosthetic device that will allow him to walk smoothly, independently, and with confidence. 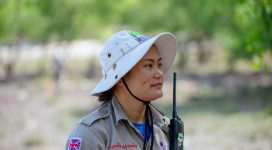 It is no surprise in Quang Tri Province that someone could be injured even twice by UXO accidents. Nguyen Bach, now 69 years old, is such a case. A native of Trieu Phong District, Bach moved to Khe Sanh in 1977, and two years later while he was preparing land for farming, he hit a cluster bomb. The explosion caused severe injuries to his abdomen. A second accident, in 1985, claimed one of his legs and made him an amputee for the rest of his life. Being the breadwinner, he had to keep going, and continued working. Bach relied on a limb made of scrap aluminum, and he managed to continue feeding his family. Today Bach no longer needs that homemade leg. A new high-quality limb from RENEW’s P&O program has been custom-fitred to Bach’s stump, giving him mobility, and comfort, and self-confidence. “I like this new leg very much,” Bach said, “because it will enable me to do every chore as a normal person does.” He walked several paces forward and backward to demonstrate his new prosthesis, in the front yard of the Tan Hop Commune Health Station where he had just been fitted. Bach and 14 other amputees had come back to the local clinic to receive new, polished and custom-made prostheses provided by Project RENEW’s mobile P&O Outreach program after their stumps were examined and molds were cast a month ago. Most of them had lost limbs due to unexploded ordnance (UXO) accidents that occurred after the war ended in 1975. 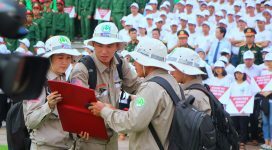 At that time their families moved to the Khe Sanh area as part of a new economic development campaign launched by the government. However, because it was a former U.S. Marine combat base, Khe Sanh and environs were heavily impacted by explosive ordnance and still are plagued by remaining post-war UXO. Originally funded by the U.S. Department of State in 2007-2008, and by the Norwegian Ministry of Foreign Affairs from 2009 to 2012, the Mobile P&O Outreach program has provided prostheses to more than 700 UXO survivors in the poorest and most remote areas of Quang Tri Province. P&O technicians travel into remote areas in a van equipped with tools and machines necessary to conduct on-site examinations, to fit and adjust the custom devices, and to make sure mobility-impaired children and adults can function comfortably with their high-quality limbs and braces. 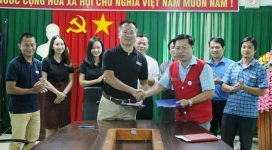 Significant new funding from DoS in 2013, through RENEW’s primary partner, Norwegian People’s Aid, is allowing the P&O program to expand its services to more new patients in the remaining, unserved areas of Quang Tri Province. The funding also supports important checkups and follow-up modifications for children and adults who have received limbs in the past as their stumps and physical features change. In addition to major funding from DoS and Norway, many American veterans and other individual donors continue to support the P&O program with small contributions of a few hundred dollars. 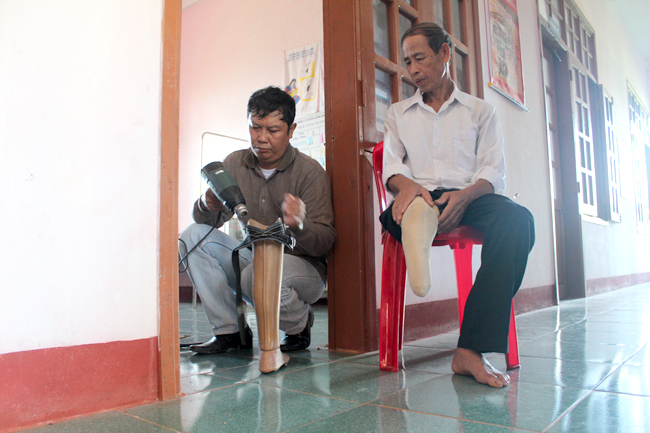 For example, $280 will provide a high-quality limb to an amputee who lost a limb due to a bomb and mine accident. Anyone interested may make a donation here. RENEW staff will keep donors informed about the use of their money and how the beneficiaries are helped.